Welcome to the E.A.D. Designs Monday Hop! You should have arrived at my blog from Joanna's blog, if not, please start the hop at the E.A.D. Designs Blog! I'm still working on a few last minute Christmas cards and I just LOVE how easy they are to put together using E.A.D. Designs Stickerz! My card today is a quick CAS card which uses the E.A.D. Designs Celebrate the Season Stickerz. 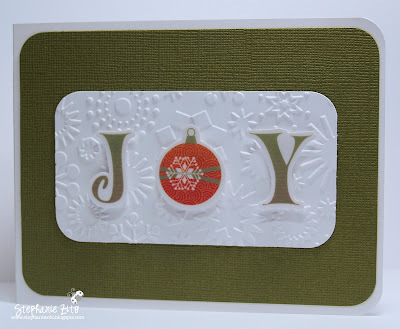 Extra products used: Bazzill cs, Cuttlebug embossing folder and CM corner rounder. Easy peasy! Since this is our last hop before Christmas, I'd like to wish all our E.A.D. Geeks a very Merry Christmas!!! You're right - it does look quick and easy to make, and it also looks very, very cute! Love the embossing and ease of the card. Great job. Love the E.A.D. Stickerz! Very cool!